"Natural Resources Development and the Administrative State: Navigating Federal Agency Regulation and Regulation Reform"
Marcella manages a division of 33 attorneys who defend the US government's energy policies in the Gulf of Mexico, Alaska and the North Slope, on the outer continental shelf, and on federal lands. She advises five client agencies: (1) Bureau of Land Management or BLM, (2) Bureau of Ocean Energy Management or BOEM, (3) Bureau of Safety and Environmental Enforcement or BSEE, (4) Office of Surface Mining Reclamation and Enforcement or OSMRE, and (5) United States Geological Survey or USGS, regarding legal issues surrounding energy and natural resources development and environmental enforcement. Marcella is a direct report to the Acting General Counsel and the Deputy Secretary. She oversees and manages all energy-related rulemaking, enforcement actions, NEPA submissions, litigation, legislative matters, royalty management, leasing, and permitting. Acting Secretary David Bernhardt appointed Marcella to the Department’s Regulatory Reform Task Force, which is charged with overseeing implementation of regulatory reform Executive Orders 13771, Reducing Regulation and Controlling Regulatory Costs, and 13777, Enforcing the Regulator Reform Agenda. Marcella is the former Deputy General Counsel at the US Environmental Protection Agency or EPA, where she oversaw the General Law Office and was named Deputy General Counsel of the Pesticides and Toxic Substances Law Office. At EPA Marcella led multiple agency-wide legal reform initiatives, and gained experience in crisis management. As a direct report to the General Counsel, Marcella advised senior leadership on the development of environmental and natural resources regulations, guidance, and policies, and managed a robust litigation docket. She led defense efforts and gained crisis management experience when the agency’s then-Administrator Pruitt was investigated by Congress, the Inspector General, and environmental activist organizations: she prepared witnesses for testimony and transcribed interviews with the congressional oversight committee, managed document production, coordinated congressional oversight request letters and corresponding FOIA requests and FOIA litigation. Marcella came to the EPA from an international law firm’s corporate energy practice based in Houston, Texas. Her practice focused on mergers & acquisitions and divestitures, securities and capital markets, corporate governance, financial restructuring, and other complex corporate matters. 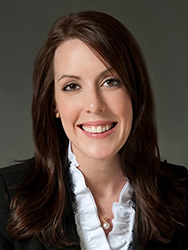 Marcella was the 2017 recipient of the Houston Outstanding Young Lawyer Award and was named a 2017 “Texas Rising Star” by Texas Lawyer Magazine. TIME Magazine called Marcella a “dynamo of a lawyer” in the article, “The Pentagon’s Letting Down Our Kids”. The Atlantic called her “a smart attorney with the powerful Akin Gump law firm” in the article, “Why Congress Should Pass ‘Kaitlyn’s Law’ Today”.